Paasi Paruppu Payasam/Moong Dal Kheer is a traditional dish prepared during all auspicious occasions of Tamil Nadu and Kerala. 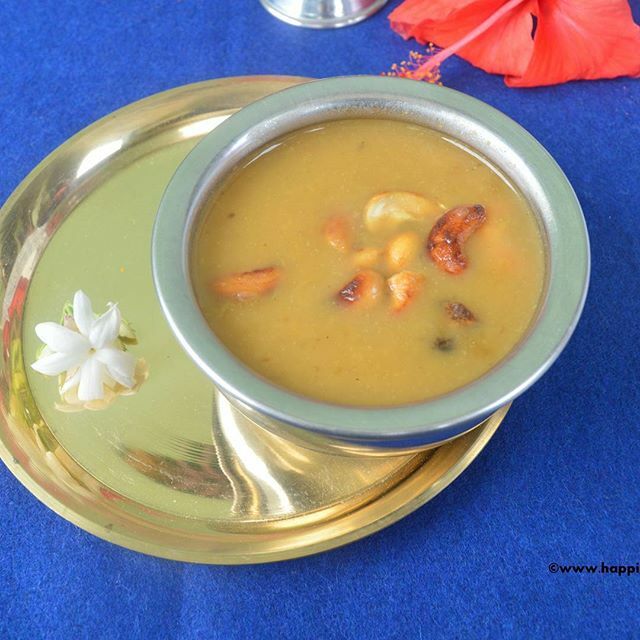 Be it a wedding or a simple pooja at home Paasi Paruppu Payasam makes its way into the menu. It is a simple,delicious and mouth-watering food. It has a very rich golden colour and a distinct aroma attached to it and you simply cant resist it.The recipe I have posted below is a very traditional one followed by my family for generations. Now lets get started with how to prepare Moong Dal Kheer. 1. Heat a kadai in low flame. Dry roast the moong dhal till a nutty fragrance comes. Once the aroma comes take the kadai off the stove and keep it aside and allow it to cool. 2. While the dhal cools start grating the jaggery and keep it ready. (tip: 1.One of the specialty of this dish is its rich golden colour. It depends on the jaggery. So always get a dark golden/dark brown jaggery. 2. for people who prefer moderate sweetness 2 cups of jaggery will be fine. For those who prefer more sweetness can add 2.5 cups of jaggery.). 3. Take a deep vessel and boil 3 cups of water in it in low flame. As the water starts to boil add the roasted moong dhal to it. 4. Allow the moong dhal to cook. 5. In the meantime, take a kadai and add 2 tbsp of ghee to it. 6. Add the cashew to it and roast them till they are golden brown. 7. Check if the dhal has soften well as shown. If not, allow it to boil for some more time. 8. If the dhal has softened, add grated jaggery to it.Stir well till the jaggery dissolves completely. 9. Take a small cup and add 4 tbsp of rice flour to it and make it into a semi thick paste. 12. By now the kheer would have a semi-thick consistency and its beautiful aroma would engulf you. Add 1tsp of cardamom powder to it to add a sweet fragrance to the kheer. 13. The Kheer is almost done. Add the roasted cashews to it and allow it to cook for 3 more minutes and switch of the stove. 14. Mouth-watering Paasi Paruppu Payasam/Moong Dhal Keer is ready. Serve it hot and enjoy. Tastes good when served hot. Can be served as an after meal dessert. One of the specialty of this dish is its rich golden colour. It depends on the jaggery. So always get a dark golden/dark brown jaggery. For those who prefer moderate sweetness 2 cups of jaggery will be fine. For those who prefer more sweetness can add 2.5 cups of jaggery.). I love this and make it very often..yours has come out so well! I have yet to try this kheer. Every time I see it in the blog world , I am tempted to try . Yours has come out so well , bookmarking . I've never tasted moong dal kheer but it surely looks delicious. I taste this payasam at a South Indian friend's house and totally loved it. Looks so delicious. We make something similar for Sivaratri. Nice one. simple yet yummilicious payasam! amma makes it quite often!